The food at lakeside cafes and restaurants is generally cheap by British and Austrian standards, is plentiful and is of good quality. Most cafes and restaurants serve traditional Hungarian dishes, international dishes and vegetarian options. Goulash (Gulyás) cooked in a pot over an open fire. Hungarian fish soup cooked over an open fire. Venison, wild boar and other game stews. Roast pork, chicken, turkey and beef steaks with various Hungarian sauces. Peppers in a tomato sauce stuffed with meat. 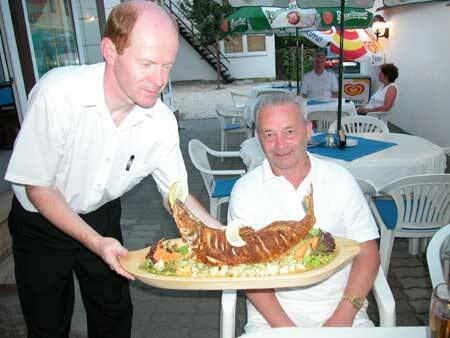 Fried game fish from the Balaton. Roast or baked trout and salmon. Main dishes are accompanied by pasta, rice, chips and other potato garnishes. There is always a choice of fresh salad and pickles. Desserts are usually strudels, pancakes, cakes and ice cream. All restaurants have a variety of beers, spirits and Hungarian wines. The dress code is informal and bathing costumes are acceptable at most lakeside open-air snack bars but shorts and tee-shirts are worn in restaurants. There is a culture of outdoor cooking in Hungary, using a cooking pot over an open fire, using a grill (barbeque) and using a brick oven. There are annual cooking competitions on the strand at Balatonboglar involving competitors cooking fish soup, gulyas or a porkolt in a bogracs (a cooking pot hung over an open fire). The competitions are fairly serious but the main aim is to have fun with friends and fellow competitors. Fruit trees are plentiful in Hungary so fresh seasonal fruit is easy to buy. Fresh fruit and vegetables can be bought at various farmers' markets, e.g. in Balatonboglár and at supermarkets like Tesco, Lidl, Aldi and Penny Market. Meat is of very good quality. Fresh and smoked meats can be found in supermarkets and at local butchers.